The air manifold gives you the ability to send air to various areas within the pond, or tank and allows you to vent off potential back pressure if you are not using all of the outlets. Connect the outlet of your air pump to a 6 or 12 way stainless steel manifold. 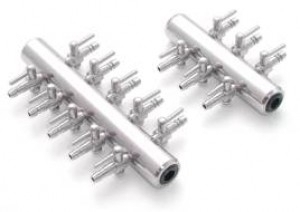 The manifold has individual valves which control the outlet of air to your air stones or diffusers. Use all available air outlets on the manifold. Do not restrict the air pumps ability to breathe and cool itself. Air stones will need periodic cleaning due to calcium and carbonate buildup from the water. Some areas around the country have hard water with a high calcium level. This calcium can eventually plug up your air stone and create unwanted back pressure on the air pump. Ceramic style air stones can be cleaned in muriatic acid for an hour to clear the calcium and return the air stone to like new performance. Clean your air stones three to four times per year in hard water areas and twice per year in soft water areas.